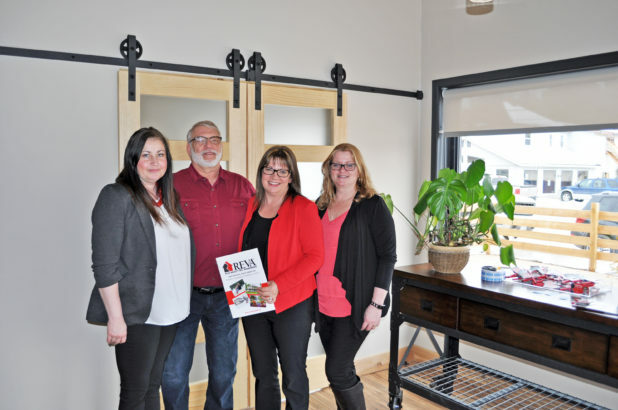 From left, Reva Realty admin assistant Candy West, real estate agent Steve Lesak, owner and agent Lisa Scott and executive officer for the Bancroft and Area Real Estate Association Dana Yonemitsu celebrate the opening of Reva Realty’s office on Flint Avenue in Bancroft. The real estate brokerage has a new commercial home on Flint Avenue, the same as TD Bank, the AGB, Choices Thrift Shop and Bancroft Public Library. Lisa Scott first started Reva Realty in December of 2016. A few months later she was joined by Steve Lesak. They worked out of the front of Scott’s home. The brokerage was planned as a “from home” business, she explained. Reva stands for “real estate virtual agents,” but it evolved into something more. Scott said she thought she would be working less when she took her business home. It turned out to be the opposite. The office wasn’t built so much for foot-traffic as it was to create a good working environment, Scott explained. She’d like to see Reva grow up to five agents once offices have been finished in the back of the building. She’d also like to see a space where North Hastings’ real estate’s ins and outs are kept — similar to a library. This could mean information resources on the area such as fishing guides, maps, property histories and educational texts on marketing or sales. Right now, Reva has two agents and one administrator. Scott said the brokerage offers something different than others in the area and that she’s not necessarily in competition with the them. In the past, she said she’s referred many people to other agents in the area because Reva’s at-home business model couldn’t support all of the clients it had. There should be “as many business models as there are types of people and clients,” she said. “Steve and I have been around for 15 years, we’ve held our market share for that long. As far as changing the landscape of the brokerages that are in town or offering more competition or less competition we’re certainly not a threat to anyone and we’re not challenged by any of the business models out there,” she said. If you’re looking to buy a property or sell you property, Scott recommended that you interview different agents from different brokerages. “Quite often as a buyer they don’t interview people, they don’t actually come in and say, ‘Well what are you prepared to do for me? What is the process if I work with you, what’s that going to look like?’” she said.